We thought we had run our last tour to the metre gauge network based upon Mirpur Khas – conversion to broad gauge of the “main line” is finished and indeed in February 2006 the first broad gauge train operated across the border from India to the Pakistan border town of Khokhrapar – but sadly with diesel traction! That, we thought, sounded the death knell to the metre gauge Nawabshah and Jhudo Loop lines which would be abandoned. But apparently, not so! 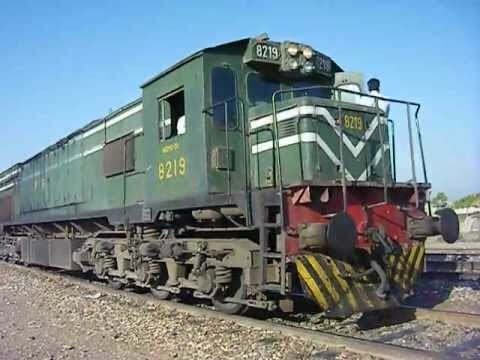 Pakistan Railways is repairing monsoon damage to these m.g. lines and the remaining SP 4-6-0 and YD 2-8-2 may well live on to steam again – in time for our next tour. Because, sadly, due to the Travel Advisory issued at the end of January 2007 by the Foreign & Commonwealth Office, by which all tour operators must abide – Peshawar and the surrounding region have been declared a “no-go” area and we were reluctantly forced to postpone our tour. We had been looking at early 2008, since the summer is not the time to visit Pakistan, and also because the LCGB planned an India tour then (which we would follow with Pakistan) but they have cancelled it, so it might even be 2009, as the political situation is still volatile, and bad weather washed away much of the upper reaches of the Khyber Pass railway. The recent (December 2007) and shocking assassination of Benazir Bhutto doesn’t help. Chairman gave orders that 10 steam locomotives were to be rehabilitated. Two of them – SGS 0-6-0 2473, and SPS 4-4-0 3078, have been restored at Lahore and have now arrived at Rawalpindi apparently in grubby but working order! We had previously thought that they had all been scrapped, but one wonders what the other 8 locos. are! Certainly there have been reports of XA and XB Pacifics hidden away in Lahore, and we plan to get to try to see them on the tour, as well a cache of SGS and other 0-6-0’s in Northern Pakistan, at a location belonging to the irrigation authority, and although they have not steamed since 1994 and probably are in no condition to work, we are inclined to include this location in our tour so that at least they can be seen and photographed. The full report about these discoveries can be found on Rob Dickinson’s web pages International Working Steam Locomotives. as The surviving CWD 2-8-2 5735, is due to go to Lahore for repairs to its motion and should easily be back by the time of our tour (as at 28 July 2011 it was still at Lahore, together with SPS 3078 and SGS 2473), which will also include two days on the Khyber Pass railway with 2 x HGS 2-8-0 – assuming that they get around to repairing the flood damage! As of today (4.10.07) there is unfortunately little evidence of this. So all of those locos. we plan to use on our tour, and you will be able to click on a link for the itinerary. Given the PR Chairman’s positive attitude to steam, I wouldn’t rule out for future trips, part of the Bostan Jcn. – Fort Sandeman line with its unique narrow gauge sleeping cars! Sadly, up to now, neither PR nor the local tourism authorities have shown any interest in reopening part of the Bostan Jcn. n.g. line as a tourist attraction, despite the fact that the Aga Khan owns a five-star hotel there (the Quetta Serena) which is reportedly practically empty most of the time! but in view of recent developments, anything could happen! One of the two narrow gauge locos. that were overhauled for the revival of that line in 1998, which never happened, is now plinthed near Rawalpindi. We hope that the future tour will include a revived Mirpur Khas metre gauge system, on which the trains will once again be able to claim the title of “last State-railway operated, regular, non-tourist, steam-hauled passenger trains in the world!” and if the political situation in Sri Lanka (Ceylon) has also calmed down, the Pakistan tour will be followed by a few days steam railtour in that delightful island. The “Viceroy Express” has been re-launched amid a lot of publicity – including a range of postage stamps! and broad gauge locos. 240 and 251 are both said to be operational, as are n.g. J220 and the Sentinel steam railcar (pictured above) – not that these can go very far as there is little narrow gauge track! But the Sri Lankans’ main problem was grease! Caltex, the main supplier, would only supply a minimum quantity of 5000kgs, whereas they need only 50-100kgs! But these problems do appear to have been oversome, so a stand-alone trip in Sri Lanka is a definite possibility. Details of these and other tours will be posted as soon as available. Our programme of tours is however constantly being updated, so keep an eye on this website! Ensure that your name is on our mailing list by writing to the address below, or completing the form on the next page. To book any of the above tours – send ¬£200 deposit, which is refundable if, when the details of the tour are confirmed, usually 6 – 8 weeks prior to departure, you decide to withdraw. If you want your deposits to be acknowledged, please include a stamped, addressed envelope.